In view of the great number of materials suitable for gundrilling as well as other variables, a table of specific grinds for all situations is not feasible. Instead, the gundrill user must understand the function of drill geometry well enough to use available tables as a starting point, and then make refinements to suite the particular setup, work material and hole specification. 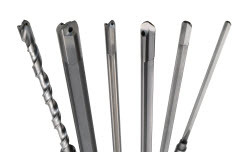 The cutting edge angles of the conventional gundrill determine chip shape, size, finish, tool life, and therefore, they determine tool efficiency. Generally, softer materials require a smaller included angle. Hard materials require a larger included angle. No single pair of angles is best for all materials, but the 30°/20° slash angle combination will drill almost any workpiece material. For some materials, it may not be 100% efficient, and changes in the included angles and lengths of cutting angles can improve performance. Ordinarily, the inside angle needs a primary clearance of 10° to 15° while the primary clearance for the outside angle will vary from 12° for hard steels, to 15° for aluminum or magnesium. In addition, the outside angle must have a form relieved secondary clearance of 15° to 25°. The secondary clearance area for the outer angle is important because it prevents heeling and it provides controlled access for the cutting fluid to reach the cutting edge. As a principle of conventional gundrill design, the edge forming the inside angle must extend 0.0005” to 0.032” past the center of the tool, depending on diameter. Coolant pressure and coolant hole size play an important part in gundrill performance. The higher the penetration rates, the more important coolant pressure and flow become to evacuate chips and lubricate the cutting edge and wear margins. Star SU provides three styles of coolant holes with the Double Jet gundrill. Single plain round coolant holes can be provided in all gundrills. Elongated coolant holes are standard in sizes .0787” through .3750”. Plain round coolant holes must be specified in these areas if elongated coolant holes are not desired. 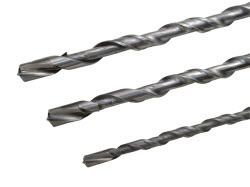 Star SU double crimp 2-flute, 2 hole gundrills improve tool performance in selected aluminum and cast iron applications by directing more coolant to the cutting edge and allowing more room for chip ejection. This is accomplished by making the tool with deeper flutes and larger coolant holes. The double crimp style gundrill has the two flutes produced by a swaging process instead of the conventional method of milling heavy wall tubing. Using thin walled tubing and swaging, the two flutes have several advantages. First, the coolant holes in the gundrill body are formed by the crimping action, eliminating a milling operation. Second, the coolant holes that are created have an irregular shape, and carry a much larger volume of coolant than comparable holes in an equivalent conventional gundrill body. Also, the flutes that are formed are much deeper than conventional milled tools because allowance does not have to be made for maintaining wall thickness from flute to coolant hole. These deeper flutes improve the chip removal efficiency of the gundrill. Star SU engineers note that gundrills produced by the swaging method are most advantageous in the smaller diameter gundrills where flute depth in most cases is double that of milled types. Star SU produces the double crimp 2 flute, 2 hole gundrills in diameter sizes from 3/16” to /9/16”. Milled gundrills are recommended for cast iron and die cast aluminum and certain special steel applications.